Netbooks are small, sleek and surprisingly good at putting real computing power in your backpack or briefcase. 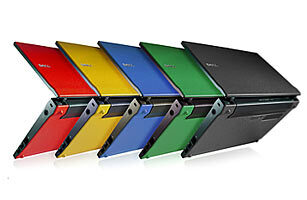 TIME's staff tested the leading netbooks on the market today, and here's what we found. Even as smart phones and TV screens get bigger, PCs are steadily shrinking. The latest low-cost laptops, dubbed netbooks because they're primarily for accessing the Internet, are lighter and cheaper than their bulkier laptop cousins. Consumers are expected to buy 25 million of the minimachines this year, making them the fastest growing computer category. Netbooks weigh under three pounds, on average, in comparison to five to seven pounds for medium-sized laptops, and more than seven pounds for those with big screens. Many of us, it turns out, will happily part with $300 to $400 to shave a few pounds off of our bulky travel bags. Along with a group of TIME staffers, I recently tested leading netbooks for ease of use, durability and comfort. We found that keyboard feel and trackpad design are what tend to distinguish one netbook from the next, given that the guts of the computers are remarkably similar. Some manufacturers, like Toshiba, opt for spaced out, tile-like, flat square keys, while others, like Asus, offer more compact keyboards to save space. Netbook keyboards range from about 80% of normal keyboard size to a full 100%, while screens average around 10 inches diagonally. Most models come equipped with Windows XP or Windows 7 (sorry, Mac fans) and a trial version of Office, along with other random software (mostly bloatware) that clutters up the desktop. On the plus side, netbooks increasingly pack in the full complement of USB and other ports, so you can connect devices like an iPhone, a thumb drive or a printer. Design approaches differ dramatically not just for the keyboards but for the machines' exteriors. Some, like Samsung's Go, are styled thoughtfully with soft edges and muted colors to blend into a modern living room, while others, like MSI's Wind U123, hark back to the starker, functional look of 1990s desktops. Disk space is no longer an issue: netbooks' built-in hard drives are robust enough  160 GB on average  to store thousands of songs, documents, pictures and videos. And all the netbooks we tested can access the Web easily using either wi-fi or an Ethernet connection. Increasingly, netbooks can also take advantage of wireless 3G access, at a cost of $60 a month and up. The models reviewed here can hold about 1,000 times the amount my laptop could less than a decade ago, at a quarter of the price, half the weight and many times the speed. And the power-to-price ratio keeps growing. Now that Microsoft has released Windows 7, netbooks are quickly getting faster. Weights and prices quoted throughout the following reviews refer to the lightest, cheapest configurations available online. In situations where laptops are too bulky to lug around and smart phones don't quite cut it, low-cost netbooks offer a lightweight alternative. Here's a guide to some of the best, in order of overall appeal. Depending on which features you value most, you might rank these differently.